Camby Low Cost Pharmacy will work with you and your doctor to produce liothyronine (T3), levothyroxine (T4) and thyroid USP in the exact dosage that you need. Hypothyroidism is a Thyroid that is Under Active. The job of the thyroid is to create the perfect amount of two different hormones, T3 and T4. These hormones regulate our metabolism which can have a large effect on our health. This can actually affect the amount of calories we are able to burn, the warmth we feel, our body weight, and the list goes on. These hormones also have a direct impact on many organs such as the heart. The cells in our bodies respond to the increase or decrease of our thyroid hormones as well as change the rate that they function at. Hypothyroidism is a condition where the thyroid does not produce enough hormones. This condition is actually fairly common. There are roughly around ten million people in the country who are suffering from this condition and most of them do not even realize it. 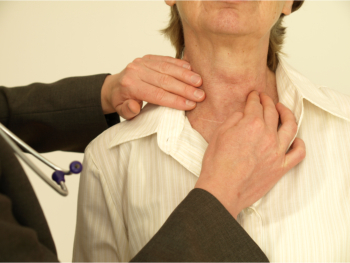 There are two common causes of hypothyroidism to consider. The first cause is the result of the thyroid gland being inflamed, which can leave many of the cells of the thyroid itself dead or damaged, thus unable to create the right amount of hormones your body needs. There is also an autoimmune disease associated with inflammatory hypothyroidism called Hashimoto’s disease. The other common cause of hypothyroidism is medical treatments. In order to treat a number of different thyroid conditions, it is required to remove a portion or even the entire thyroid itself. This will make it difficult or impossible for your body to continue producing the hormones your body needs, thus developing hypothyroidism. Another cause of hypothyroidism that is not common but can arise from time to time is when a seemingly normal thyroid gland is unable to produce the correct amount of hormones because of an issue with the pituitary gland. There are many different medications and preparations available to treat hypothyroidism. However, everyone is different and everyone will need a different form of treatment that effectively combats their condition, especially since there are many aspects to keep in mind when it comes down to treating hypothyroidism. The most popular or common treatment is to administer levothyroxine every day. This is the pure synthetic form of the T4 hormone. This is made in a lab in order to make sure that it is exactly the same as the T4 hormones your body produces naturally. There are different strengths available to make it more accessible to more patients but since everyone is different, the dosage can be altered to meet your exact needs. When you are unable to find the medications that you need for a healthier life, we can work with you and your doctor to produce liothyronine (T3), levothyroxine (T4) and thyroid USP in the exact dosage that you need. We will also monitor the effects of the medication and provide adjustments as needed to ensure you are receiving the best results possible. To get started, just give us a call now at 317-548-8015.